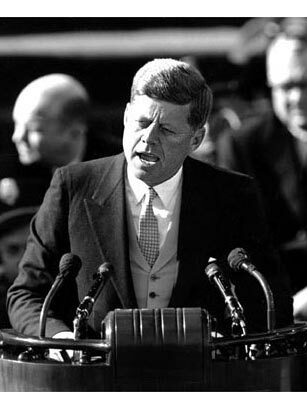 John F. Kennedy was president for only 1,000 days, from his 1961 inauguration to his assassination in Dallas, Texas, on November 22, 1963. In naming JFK 1961's Man of the Year (1/5/62), TIME wrote, "In his first year as President, John Fitzgerald Kennedy showed qualities that have made him a promising leader ... Those same qualities, if developed further, may make him a great President." In 1960, Kennedy narrowly defeated Richard Nixon to become the 35th  and first Roman Catholic  president of the U.S. He led the U.S. through several international crises, including the Bay of Pigs and the Cuban Missile Crisis, and he increased the American military commitment to South Vietnam. Domestically, he endorsed major civil rights legislation at the urging of his brother Robert, the attorney general of the U.S., and he signed executive orders ending segregation in federal housing and mandating affirmative action in government agencies. Other domestic initiatives to fight poverty and improve public education and medical care for the elderly were not enacted by the time of his death.